If your garage is due for an upgrade, look no further than Custom Garage Works! We have been offering a selection of custom garage services such as garage floor coating in Allen, TX since we first started in 2003. While we were unable to locate the services we wanted inside of the industry, we did not let that stop us, but instead, we made the decision to join the industry ourselves. Now, we proudly provide professional garage storage solutions, along with top-of-the-line polyurea polyaspartic floor coatings, that have a much longer lifespan than epoxy. Our team is professional trained, and we are passionate about designing custom garages, with impressive garage floor coating results across DFW. Rising in popularity with each passing year, our garage floor coating in Allen, TX is among the best you can find in DFW. This coating is so popular because it is both more resilient, and cures quicker than traditional epoxy. Thanks to the tough composition, our polyurea-based floor coating is resistant to yellowing and failing that can occur with epoxy. In addition to our floor preparation, which incorporates professional diamond grinding, as opposed to acid etching, the end result is a showroom quality floor that is easy to clean, and practically indestructible. If you’d like to learn more about our reliable garage floor coating services, give us a ring at 214-494-9068 or 817-308-1305 and schedule your free estimate! Thanks to Custom Garage Works’ organization solutions, you never need to worry about running out of space in your garage again. 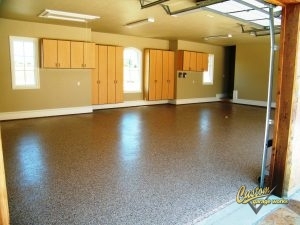 We know that a brand new garage floor looks greatest when it isn’t covered by other items in your garage. With products such as garage cabinets and overhead storage racks, we have a variety of solutions for our clients’ garage organization requirements. We carry some of the most resilient overhead storage racks in the industry, and our garage cabinets are specifically designed for garage needs. At Custom Garage Works, we are committed to installing the optimal garage floor coating in Allen, TX, and designing the most efficient organization solution for our clients, and we look forward to serving you soon! Overhead Storage Racks If you need to get more from your overhead storage space, our storage racks provide safe and reliable storage. And More! 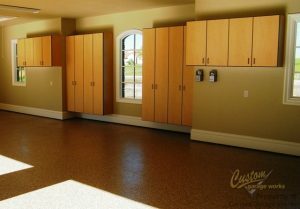 We offer a wide variety of garage organization resolutions to our clients, to provide the optimal custom garage!